The Udarata Rajadhaniya was the last kingdom of the centuries old, long standing, monarchical Sinhala state. Udarata was, therefore, the last repository of Sinhala dance, not the first. ‘The Ceylon dancer is heir to a great tradition which goes back in time’, said Chitrasena. ‘A variety of dance forms have developed, which we today divide into Low country and Kandyan dance.’ Sri Lanka has had a long tradition of dance, agreed Mudiyanse Dissanayake, ‘very few countries can match the richness and authenticity of our dances.’ The Udarata dance is not connected to the Buddhist ritual. It is performed in the non-Buddhist rituals directed at gods (madu), demons (tovil) and planets (bali). Even at present the principal attraction in these rituals for the audience was the dance, said A. J. Gunawardena. The dance style of the Udarata kingdom became known as ‘Kandyan dance’ in the 19th Century. Kandyan dance was ‘undoubtedly an extant fragment of a much more complete art which has died out in Ceylon, said George Keyt. It is a dance of great distinction deploying a grace not easy to emulate. It is full blooded and vigorous. It cannot be put into the category of folk art. It is part of a society which though rural is nevertheless sophisticated unlike the villages in Europe.’ (G. Keyt, Some notes on Kandyan dancing, New Lanka January 1953). ‘Though fragmentarily preserved, the Kandyan dance is one of the great dance systems of Southeast Asia’, said Herbert Keuneman. The finest and most complete presentation of Udarata dance is seen in the ritual known as Kohomba Kankariya. The entire vocabulary of the Kandyan dance and its drumming is seen in this ritual, said W. B. Makuloluwa. The Kankariya was very seldom held but these superb dances are worth preserving, said Chitrasena. The most impressive dances are the Ves netum, with ves tattuva, warrior-like costumes and elaborate, difficult dances. There are other dances which are also considered to be of Udarata origin. The word "vannam" comes from the Sinhala word "varnana". Originally, vannam had been songs composed by Sinhala poets, said Bandula Jayawardena, traditional dancers later added dance to them. There are 18 vannam in Kandyan dance each dealing with a specific animal, such as ‘gajaga’ (elephant), ‘thuranga’ (horse), ‘mayura’ (peacock), ‘musaladi’ (hare), ‘ukussa’ (eagle), hanuma (monkey). There is also ‘gahaka’ (conch shell) vannama, ‘vyrodi’ (precious stone) ‘eeradi’ (arrow), ‘Surapathi’ (in praise of the goddess Surapathi), ‘Ganapathi’ (in praise of the god Ganapathi), ‘uduhara’ (expressing the pomp and majesty of the king), and ‘asadhrusa’ (extolling the merit of Buddha). I do not consider vannam a part of Udarata dance. It is clearly external to the tradition. The udekki was used in the royal palace for prasasthi and in the home as an accompaniment to song. The udekki is a small lacquered hand drum in the shape of an hourglass, about seven and half inches (18 centimeters) high. It is a very difficult instrument to play. Udekki dance was a very prestigious dance in the past. It had its own rhythms, steps and songs. The performer must simultaneously sing, dance and accompany himself with the udekki, tightening the strings to obtain variations of pitch. Such a concentration of talent in a single person is uncommon and for this as well as other reasons, udekki had ceased to be widely practiced, said A.H.E Molamure in 1956. They had long since ceased performance, said Keyt, as well. However, K. D. G. Sumanadasa, writing on the traditional dancer families of Matale District (1996) said the udekki dance troupe of Kandegedera Dingiri Banda of Alutgama, Kalundewa, near Dambulla was well known in the Matale District. Udarata dance also included the panteru dance. The panteru is like a tambourine, without the skin, with small cymbals attached at intervals around its circumference. Sinhala kings employed panteru dancers to celebrate victories in the battlefield. Panteru dancer is dressed in plain white loincloth with a red band or kerchief round his waist. His torso is bare or covered with a breast plate made of colourful beads. Panteru and udekki were now on the verge of extinction, said Molamure in 1956. There is the difficulty of their techniques. Also the rival attraction of the ves dance. The more austerely danced udekki and panteru dancer has to rely on his own technical skill and artistry and few today consider the exacting discipline worthwhile. However, both dances now appear in the Esala Perahera in Kandy as well as in present day dance presentations. George Keyt also speaks of three ‘folk’ dances, raban, leekeli and kalagedi. The raban dances included singing, virindu and balancing a revolving rabana. There were acrobatic interludes to this dance, he said. There were two forms of leekeli dance, one was called Savaram, he stated. The dancers never strike each other’s sticks; they only make out that they are about to do so. They strike their own sticks instead. The drumming differs for the two leekeli dances. The kalagedi dance was an old one, Keyt continued. It was initially danced to the pana drum, smaller than the geta bera, which gave out sharp abrupt beats. ‘There is a charming description of this dance in folk poetry,’ he said. The ‘Kandyan dance’ was performed in three of the four ‘Maha Disawani’ of the Udarata kingdom, (Satara Korale, Sat Korale and Matale), one ‘Sulu Disawa’ (Udapalata), and the six ‘ratas’ around the capital city, Yatinuwara, Udunuwara, Tumpane, Harispattuwa, Dumbara and Hewaheta. Kandy is in Yatinuwara. There are three schools of dance, ‘Mahanuwara’, ‘Kurunegala’ and ‘Kegalle’. The natum parampara of the Mahanuwara tradition resided at Amunugama, Gadaladeniya, Nittawela, Malagammana, Rangama, Talgahagoda, Tiththapajjala, Udupihille and Rattota. Also Kahalla, Ihalawela, Moladanda and Yakawela. The dancer, Gunaya, was from Nittawela, drummer Suramba and dancer Sri Jayana from Amunugama, Sedara and Heen Baba were from Talgahagoda. Some dance families in the Mahanuwara tradition can trace their lineage far back. In Matale , in the 1990s the Udupihilla family could be traced back to about nine generations, Tambilideniya family to seven generations and Nagalawewa family, five generations. Tambilideniya ancestors had performed before King Sri Wickrema Rajasinha and received a patawa drum. There have been sub-traditions within the main tradition. The Begiriya family followed the Idamegama dancing tradition. Kumbiyangaha Ela family elders had learned dancing from Padivita and Weligamwala dancers. Nagalawewa family came from the Malagane dancing family of Moneragala. An ancestor migrated to Matale. The ‘Sat korale’ or ‘Kurunegala’ parampara were at Ahugoda, Bawilgamuwa, Damunugolle, Goratiyawa, Makehelwala, Muruthawa Polgahawela and Ranawana. Polgahawela held the highest position. Piyasara Silpadhipathi belongs to this tradition. The Kohomba Kankariya traditions differed in the Mahanuwara and Kurunegala schools. The size of the ves tattuva too. Wellawa (Kurunegala) had 16 units, Thiththapajjala (Mahanuwara) had 13 units. The ‘Satara korale’ or ‘Kegalle ‘parampara were at Algama, Andurapata, Attanagoda, Budawatte, Galapitamada, Hikgoda, Imbulgoda, Kotawella, Lihiniyakaduwa, Mahakehelwala, Muddanawa, Siyambalapitiya and Tibbotunuwa. Algama ranked first. Alagama paramparawa has produced fine dancers, drummers, exorcists and a famed group of temple painters. They trace their dancing tradition to King Kirti Sri Rajasinha. This paramparawa has produced three master dancers in the 20th century, Sithrachariya Nekathige Siriya (Algama Siriya), Siriya’s son Kiriganitha and grandson Pani Bharatha. In the Udarata kingdom, artistes such as dancers were organized into ‘guilds’ and were given agricultural lands (nindagam) in return for their services. Therefore, dancers were farmers as well. They went straight from their paddy fields to dance in kankariya, pinkam, and perahera. Today, Talgahagoda family holds land owned by the Talgahagoda Rajamaha Vihara and they are in charge of the Talgahagoda Kohomba Devale. Dancers also knew astrology, medicine, painting and drawing. This is shown in their names such as Ganthachariya, Vaidyacharya, Piyumachchariya, Shilpadipathi and Rangadhipathi. The most suitable horoscopes for dancers were those with Mithuna, Kanya, Vraushabha lagna having a graha pihitima of suru, buda or thula. Kandyan dancing is highly developed because dancers and drummers trained for several years to acquire the high standard of technical perfection required, observed Chitrasena. Many years of arduous training and practice were needed to become a good dancer, said Molamure. It was a demanding and challenging profession. Dancers needed continuous practice and much endurance. Training began early, around the age of eight, under a relative, usually father or uncle. The first lesson took place at an auspicious time. The teacher was given a ceremonial gift of cloth, copper and brass vessels and a thuppetti of fruits, vegetable, rice and spices. The pupil learnt drumming as well as dancing but selected one of the two later on. The training took 10-15 years. It starts with ‘pa haramba’ exercises using the barre or Dandiyama, ‘goda haramba,’ the off- the-barre exercises and 'ath saramba' or hand drills. Intricate footwork, circular dance (vattam) and song accompaniment came later. There were three different speeds of dancing, slow, moderate, and fast, each double the previous tempo. Each dance movement had several sections, ‘pada’, ‘kastirama’, ‘sirumaruwa’ and ‘adavva’. The dancer must be able to perform the dances, recite the chants and conduct at least one complete ritual before he graduates as a dancer, said W. B. Makuloluwa. A sound knowledge of the Kohomba Kankariya was essential. The training may not have had a written syllabus or set time table, like today, but there would surely have been some sort of plan and sequence in the teaching. Otherwise, the Udarata dance could not have achieved the position it holds today. Dance teachers also had the option of practising ‘guru mushti’, the right to impart the finer points only to the most worthy pupil. Pani Bharatha (b.1920) recalled that at Algama, the boys would come in the evening, tuck up their sarongs and learn dancing from his uncle Siriya. Elsewhere in the garden, there would be groups learning hewisi and bera haramba. The dancers also learnt other skills such as mending drums. The wives took over the classes when the men left to participate in rituals. Tissa Kariyawasam (b.1942) observed that in his time too ‘all the boys in a village learned to dance’. Piyasara Silpadhipathy (b. 1945) recalled that there was advanced training for talented dancers in his grandfather’s gurugedera at Polgahawela. There was a separate hall for the dancers to rest. The dancers also experimented with new dance steps, said Piyasara. Piyasara and other family members had joined them in the evening and learnt dance and drumming. Pupils participated in festivals and peraheras at a very young age. Piyasara recalled: ‘We went with our elders and performed in peraheras as novices’. 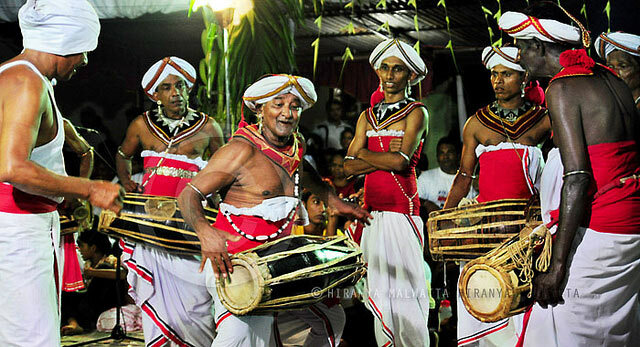 Sugath Malagammana had participated in the Esala perahera, Kandy as a drummer from the age of seven. Pupils also attended Kohomba Kankariya performances, helping out and observing. Piyasara had gone to kankariyas with his uncle at the age of 10. This trend is still continuing. At the Kala Pola, in Colombo in January 2016, two little boys about 8 or 9 years old, participated in the raban natum, balancing three rabanas with a stand held in the mouth. We gave them a clap. The trainee dancer first performed as a naiyyadi dancer, wearing the tani kachchi costume with a turban. W. B. Makuloluwa sees Naiyyadi as the ‘undergraduate’ level of Kandyan dancing, prior to moving onto ves dance. Keyt however said the original Naiyyandi was a lasya or female dance created by a woman. It is now danced by men. Naiyyadi dance is performed in the early stages of the Kohomba Kankariya, and also at Vishnu and Kataragama devales in Kandy on ceremonial occasions. The dancer’s graduation ceremony is known as ves bandima, where for the first time, the ves tattuva is placed on the dancer’s head. This is a very important event in the life of a dancer. The ritual is considered sacred and the person has to abstain from impure acts for a week or so before. The ritual takes place in the temple before an audience of relative and friends. The pupil gives gifts to his teacher and the audience gives gifts to the dancer. After the ceremony, the new dancer performs the ‘kala eli natima’ or ‘magul yak kankariya’. He is then qualified to participate in his first Kohomba Kankariya. The ritual dancer seldom has to retire from dance before the age of sixty.